One fortunate thing about the rescue community is just that: community. We got an Email one day from another rescue, who had recieved another Email from a woman in Sacramento searching for help. The woman had reported a young cat in front of her home, on a busy road. She stated that he was blind and had a broken leg. Clearly, action needed to be taken immediately. After an entire day of Emails, calls, networking and facebook, we got ahold of a woman in Sacramento who could go out to trap the cat the next morning. She was very experienced, fortunately! She trapped "Johnny" after some stressful chasing and finally covering him with a towel. Although he was very scared, there was so much calmness as soon as we knew he was safe. Update: 2/4/13 Johnny is still doing great at Nine Lives Foundation and they love him. He wobbles around the treatment rooms and everyone really cares about him. Nice! Allister was rescued at 7 months old from the streets of Berkeley. A kind homeless woman had seen him fall from the 4th level of an apartment complex. When she found him, the fall did not seem to have injured him but his eyes were both in horrible condition. Although the woman wished she could keep him herself, she took him to a nearby shelter. With shelters as full as they are, and fund limited, volunteers of the shelter networking for Allister to find rescue. They found donated to help raise a ChipIn for his much needed surgery and posted him all over the internet. Meagan was the first to see him at 11:30 one night and it was then and there that she knew she needed to help him. The next morning, she drove to the East Bay where she rescued Allister and another sweet tabby cat, Steve (estimated at 19 years and adopted just two days later). We immediately drove these two directly to Nine Lives Foundation where Allister was scheduled for surgery the next morning. He had glaucoma in one eye, causing the eye to be able twice the size it should have been and under extreme amount of pressure. The other eye had ulcered so badly that it wasn't recognizable as an eye any longer. 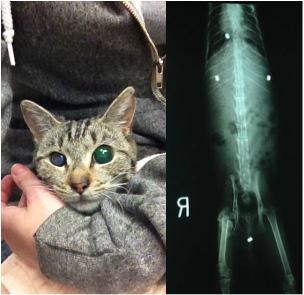 What pain this cat could have been in is beyond us. We opted to remove both eyes, as he probably only had very poor vision from his "big eye". He made it through surgery perfectly but then picked up a nasty shelter flu which caused him to loose nearly 4 pounds. After a few weeks of recovery, Allister was healed, happy and was introduced to the other foster kittens in the home. Allister has now been adopted into a wonderful home, with a sweet kitten he adored and become quite bonded to.